Oftentimes, we think that over the counter medicine is all you need to cure your children of illness. We often depend on it too much that we don't realize that every medicine has its own side effect. But the reality is, there are healthier options in helping your children get through an illness and even keep them away from any disease. Using essential oils for children is one of the most effective homeopathic and therapeutic treatments you can give your children. Essential oils can be used in different ways; it can be applied directly to the skin or can be used as an aromatherapy with the use of a diffuser. No matter how you use it, you can always reap the benefits of pure natural benefits that would definitely help your child better than medicine. It provides both cure and prevention. You can use essential oils in many ways depending on how you're going to use it. When using essential oils, it is best recommended to dilute it in carrier oil. If you're going to use it at home, you dilute 30 drops of essential oil in every ounce of carrier oil. If you're going to use it on your baby, just use only 6 drops. Since there are so many essential oils out there, you would want to know which one among the list of many brands of essential oils for babies and kids would be best for you and your household. We have made a list of the best essential oils for kids, so bear with us until the end. Essential oils may be the best way of providing you and your home comfort and ease because for just a few drops, you will definitely be able to benefit from it for a long period of time. Healing Solutions have their own mix of therapeutic blends that will suit your child or babies' needs for any occasion you may need it for. Breathe Blend is a blend of essential oils for babies' cold. It is made with a mix of Peppermint, Eucalyptus, Lemon and Rosemary. It helps your child breathe better and aid in declogging the nasal passageway. It helps relax your kids when they are in a tight battle against colds. The Good Night Blend is a mix of Roman Chamomile, Marjoram, Sandalwood, Ylang Ylang, Lavender, and Vanilla. It is an essential oil blend for kids that relax them to sleep better at night. It's a great aromatherapy for your children at night because these essential oils relax their senses and the body as a result. The Head Ease Blend says it all. It is a therapeutic treatment for your little's one's flu and headache. It is a mix of peppermint, lavender, cilantro, frankincense, roman chamomile, marjoram, rosemary, basil, and wintergreen. Deep Muscle Relief Blend also says what it's for. It is an essential oil blend for kids that helps is relaxing the muscles. It's a mix of peppermint, camphor, German chamomile, blue tansy, osmanthus, helichrysum, and wintergreen. There may be times when your child gets too active and this is literally the best cure for it. Stress Relief on the other hand also serves as an aromatherapy relaxant with a mix of Blood Orange, Patchouli, Grapefruit, Ylang Ylang & Bergamot. Lastly, comes the Health Shield Blend, it's not only a blend of essential oils for sick kids, but it is also best for healthy children too. It is an immunity booster made of Eucalyptus, Clove, Rosemary, Lemon and Cinnamon. These essential oils are all around helpful to you and especially your kids. Every blend is carefully mixed for the sake of your child's safety. There are some essential oils that are not child safe but every single one of these blends are perfect for your kids. They are also proven to be all-natural and organic. That's why this is our top pick for the Best essential oil blends for kids. Although it says that it mainly sells a diffuser, it sells a packing set of pure essential oils. These essential oils work for mommies, daddies, and babies too. This gift set bundle comes with 6 pure essential oils namely, lavender, eucalyptus, peppermint, rosemary, tea tree and sweet orange. What's so great about these pure essential oils is that each oil can provide your family with great health benefits. Tea tree oil is actually great as an insect repellant. It also doubles as an anti-fungal and antibacterial oil so you can dilute it in a carrier oil and spread a little on your little tot to keep bugs away. If you're reluctant to spread it directly on his/her skin, you can simply wipe it on your child's clothes to keep insects away. Lavender oil, on the other hand, gives that sweet flower scent that literally soothes you on the breath. Every smell gives you that super mind blowing release that you've been craving for after an entire day's hard work. It also helps in soothing sunburns and can also be topically used as a first aid treatment for minor burns. However, don't use it on open wounds. Eucalyptus oil serves both as an insect repellant but it is the best essential oil for colds in children and adults. Just leave it on your diffuser and your children's colds will easily be relieved and cured. Peppermint also works as an awesome decongestant but mainly it also works well as essential oils for constipation in toddlers and children. Citrus oils are best when you want your little kids to sleep easily and well at night. Some kids can be overstimulated so better use this as a solution to help calm your children down. You will absolutely love these oils especially since you already have a diffuser that comes with it. And for those great reasons, this is our second pick for the best essential oils for kids. One of the reasons why this is on our top picks is mainly because of the fact that they are purely non-GMO organic oils. The plants where the oils were extracted from were purely organic without the use of pesticides and harmful chemicals to make sure that every drop of oil is at its utmost benefit. The containers are also sulfate-free and parabens-free. That way, you know that each drop of oil is all the best for you and your family, especially for your children. The different blends are made for different purposes. You can use them diluted and spread on your little one's skin or yours too. You can use them as essential oils for child behavior especially the relax and sleep blend. This blend works so well in relaxing your child especially when they get too active due to the sugar rush, excitement or just plain active. The immune blend is one common synergy blend that is made to boost your child’s immune system, it's therapeutically said to be very beneficial and sure enough, it really is. As a daily diffused blend, you can try the focus formula. This keeps your senses as well as your child's highly alert. It works wonders since these essential oils for children can really help your child focus on learning and studies and also works as a relaxing agent. Your child will have the tendency to be sharper. We also love Essenzia's AlternaKids Aromatherapy synergy blend of essential oils for sick kids. The breath better blend is the utmost greatest blend for colds. While the Aches and Pains blend are best for calming muscles down and clearing body aches, this one is one topical essential oil that really helps your child when they get aches from either illness or overstimulated fun. 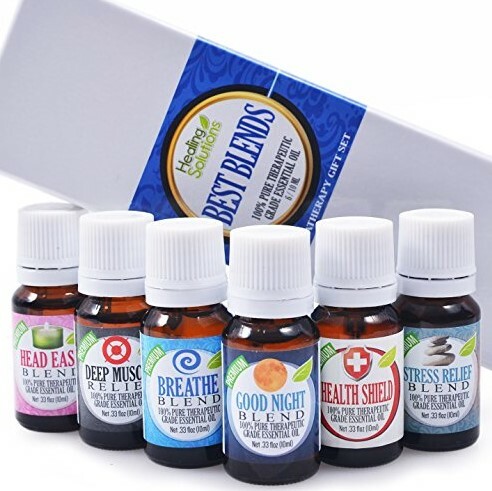 These are one of the best blends you can find and also the safest for your children that's why this is our third best essential oils in our list. This is an easy to carry around essential oils. We love bringing this to camps and long trips because roll-on bottles do not spill! It's the best set alternative for colognes and perfumes that are definitely safe for your children. Your kids will absolutely love and enjoy their essential oils because these oils serve many functions too. You will also love the bottle because they are dark bottles that prevent any photochemical reactions or chemical reactions as a result of exposing your essential oils to sunlight. These easy to apply essential oils are one of our favorites because they can also act as a direct topical treatment with lesser hassle on measuring the proper ratio for diluting essential oil blends for kids. Essential oils work so well in keeping your child sniffle free with the sniffle stopper. It's so far the best essential oil for congested in children that we have tried. It's really great in relieving stuffy noses and speeds up colds. One of the key essential oils for kids is the Focus focus focus blend. It is a blend that really keeps your child alert and becomes sharper. They get to be very calm and also have the tendency to stay relaxed and do activities with lesser energy. When your children get extremely active and really difficult to handle, just spend about 10 minutes in his/her room as you let this synergy blend diffuse in your humidifier or aromatherapy diffuser and your child will definitely be more relaxed. This is the stage where teaching them something becomes a breeze. They have other essential oil blends that you will love like the aches and pains that not only treats body aches but also tummy aches too. You will definitely love exploring the other uses of these synergy blends aside from what they are meant to do. And for that reason, this makes our fourth pick for the best essential oils for kids set. Aches and Pains, Calm 'em down, Focus Focus Focus, Healthy Hero, Sniffles and Sneezes, Sound Asleep. These essential oils for kids are very helpful in keeping your little one in the best condition. The Immune Boom says it all - it's an immune system booster. Essential oils can definitely help in boosting your children's immunity especially when applied topically and frequently. Our favorite essential oils blend for kids is the skin soother. This is one reason why we love this brand because these are great essential oils for allergies ﻿children may often have. You only need to apply it directly on the skin especially the pre-diluted roll-ons to prevent itchiness and dryness. It works so well that you won't have the need to give your child antihistamine to alleviate the effects of allergies. Actually, not a lot of synergy blend brands have essential oils for allergies in toddlers. You will also love the nighty night blend. The sweet aroma is something we cannot get enough of. It really helps keep children calm and surprisingly acts as a non-anaesthetic sedative. Sedatives may leave us with a bad impression but not all sedatives are dangerous. This nighty night blend may act as a sedative but it is a relaxing and healthier way of keeping your child fast asleep through the night, even adults suffering from insomnia can benefit from it. Tummy all better works so well if your use it topically over your little one's tummy especially when they experience cramps or constipation and diarrhea. It relieves the pain and even helps out with the bowel movement. Essential oils are very beneficial because they are directly absorbed and used by the skin, so the effects are quick and helpful. Other essential oils work best as essential oils for constipation in children with the tummy all better and also as great essential oils for babies’ cold in the sniffle stopper. You can discover great uses for these essential oils not just for the purpose it was meant for. You can use them as cologne of your liking without suffering from side effects. That's why we love this and placed it in fifth as the best essential oils for children. Essential oils really are what's good for your children. They don't have to serve the purpose of being essential oils for sick kids; they can be great essential oils for any season and any day. These essential oils for children work well for you and the rest of your family too. In fact, it is assured to be organic and safe. These essential oils are exactly what they are, essential to your children and your daily needs. So whichever you pick to buy, you won't regret any of it.